WHO can predict what will happen over the next month, considering that both Thanksgiving and Christmas will be thrown into the mix. And might I say again that this is my hands down favorite time of year and I am very much looking forward to the next month of celebration(s) in various forms? Oh, because I am. I LOVE this time of year! Last month I mentioned that I would just be takin' my own sweet time in reading whatever I liked or struck my fancy. 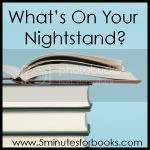 The top book on my "nightstand" last month, makes the top of the list this time also. I'm almost finished with it. I've been lingering. Ok, I've been a little busy but I've ALSO been lingering over it. I am absolutely loving it! Maybe I'm lingering because I just don't want it to end? I can tell you that, without a doubt, I would have loved the company of Winston Churchill. If I get started telling you about how much I just get a kick out of the guy, I'll be writing out the whole book review here and now. Since I haven't finished it yet, I'm going to stop talking and move on! 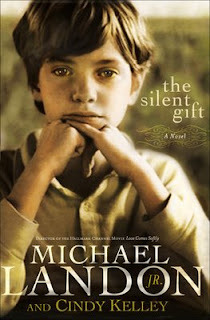 I DID finish reading The Silent Gift and TOTALLY loved it! It was well worth the reading time and energy. That said, it didn't take much time and it didn't require much energy. Fabulous read from start to finish and I highly recommend it. You can read my review of The Silent Gift here. I'm not sure what I'll get to, due to the aforementioned holidays, but these four are the ones I am eyeing most greedily at the moment and have the highest hopes for. I am also grateful that this year is almost over! It's been a hard sort of year and I'm ready for a new start and new beginnings. That said, I'd still like to finish a few books before the year is out! I think you have inspired me to read Franklin and Winston. I have been interested in it since it first came out, but never got around to reading it. 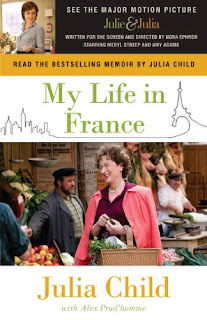 My Life in France sounds right up my alley. You've got some great books picked out there. Happy Reading! I would love to read Franklin and Winston, too. I've always been amused and inspired by Churchill. I HOPE you like Redeeming Love. I'll feel somewhat responsible if you don't, since I've recommended it so heartily. Redeeming Love looks good. I hear great things about Francine Rivers. You are far more ambitious than I, friend! 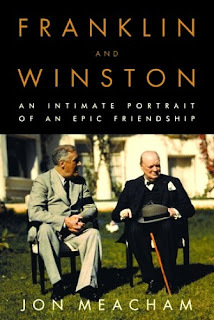 The Roosevelt and Churchill book looks good -- I'll be looking forward to your review. I read Redeeming Love years ago -- mixed emotions. I love your list or read and to read. Adding to my list to read. I keep thinking about reading The Silent Gift but I worry about the sad factor. I'm still looking forward to your Franklin and Winston review. Amy and I are on the same page! I found Redeeming Love to be the single romance novel of alltime. I've never enjoyed romance as a genre and yet Rivers captivated me by her allegorical story telling - the book of Hosea. 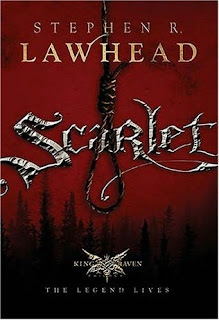 Ooh, I'm really looking forward to your review of Scarlet; I've been wanting to read those books for a long time! 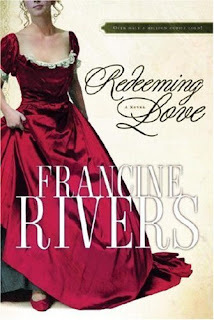 Redeeming Love's also been on my maybe-someday list; I've never read Rivers before, but I've heard she's really good. And Mohler's book: COOL! I didn't know he had actually written books [yet]; I went to school with his daughter! He delivered our graduation speech! Can't wait to see your review on it. And many, many blessings to you and your family this year, Carrie. I hope you and yours can see God's goodnesss this Thanksgiving, even in the midst (and because) of trials. God bless. You have very interesting books on your nightstand and I am very curious about Rdeeming Love. Will be back later to see what you thought of it. I'm glad I'm not the only one who doesn't finish all her books in one month. ;-) The Franklin/Winston books soundsa delightful. A friend gave me Redeeming Love last week. Maybe by January I'll get to it. 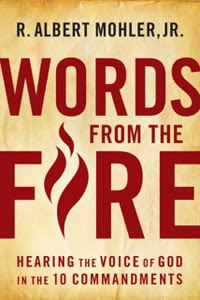 I'll be interested in how Words from the Fire goes. Sounds enlightening. Happy reading to you, Carrie- I hope you get to linger over the books that bring you the most joy! All of those look like such good books - happy reading! I love to find out what books others loved. Thanks for these two recommendations. Get to Redeeming Love! You won't be sorry. I read this Tuesday morning when I was in a rush, but I didn't comment. I wanted to tell you that a friend was just talking about Redeeming Love (adding to the bajillion blog praises), so I think it will make my list soon. Okay, I must MUST read Franklin and Winston soon. It's on my list, but I tend to move slowly (and my list is SO long!). Good to hear a whole-hearted recommend on it. Happy Thanksgiving! I love/adore Redeeming Love. It was one of the only books that has actually brought me to tears. It is definitely worth your reading time and it will make you appreciate God's love for you in new ways!